My life philosophy can be distilled down to this equation: Handcrafted + Not Like Everyone Else = Cool! I'm Jaime Eads Maraia and I am a cancer-surviving, crochet-loving, cooking-school dropout! I am lucky that I can stay home with my two girls, my 5-year-old Mims, and my 91-year-old grandma Mema. I have an awesome family that loves and supports me, despite my yarn-y obsessions. I live in Southern California, where I am forty-five minutes from the beach, an hour and a half from the mountains, and three minutes from Disneyland. My books are currently Amazon exclusives for the Kindle. You can purchase them HERE. I think you are inspiring, and it's awesome that your Grams is 91, God bless her. Landed on your blog via All Free Crochet's link to your London bag (love it!!). I love everything you've done and had to follow! Thanks Nancy! That's really sweet! And it's so fun to have new readers! Glad you became a Dynamo!! Just found your blog. I love it. I saw the crochet pattern for the lip balm holder and let me tell ya, you have just gave me a ton of work to do lol I am going to make them for my daughter's Junior troop for an end of the year gift. A lot of the girls-mine included-are moving up to Cadets next year. That is just a terrific present my daughter can give to the girls. Hi Jean! Sorry for the extra work! LOL!!! If it helps, they work up really quickly! Thanks for stopping by! I have a crochet question on checking my gauge. The project I'm working on now says: 12 dc and 6 rows to 3". My 6 rows equals 3", but my 12 dc equals 4". I'm working on a baby blanket so the gauge isn't crucial, but on anything I do it's always like that. One part is right and the other is off. If I try another hook then the part that was right will be off. Do you have any suggestions? PS: I really like your work! Hi Cindy! Your problem is super common. It's hard to crochet exactly to someone else's gauge. Since you can only use one, I would start by working to get the stitch gauge right first and then see how far off the row gauge is. Ultimately you can't control row gauge as much as you can control the stitch gauge, so that's where I personally always start. Hi Jaime, My name is Breanne. I am a very beginning crocheter. I adore the hats you are wearing at the top of your blog. Are they simply made? Could a beginner do one? If so...where can I find the pattern??? Hi Breanne! Welcome to my site! The hats that Mims and I are wearing on the November banner at the top of the blog are simply made and a beginner could do one. They are actually the ebook exclusive patterns in my 2nd book, Crochet Dynamite: Gifts for Your Besties, which is available in the Amazon Kindle store for less than a buck (Kindle software is available for FREE for your computer, tablet and smart phone)! I have a couple of hat patterns available for free on the blog, if you'd like to try out my patterns before you commit to purchasing one. Just found your site...WOW - I'm impressed!! My question -- what the heck is a Magic Circle? Hi CK! Thanks! I'm glad you found me! Jaime, I also just ran into your blog (thru All Free Crochet) and am totally inspired and thank you for sharing your story. Best wishes to you and your "Mema" and how adorable is the name "Mims". I have four "M's" Mariah, Marcus, Madison and Mason! I look forward to seeing more of your creations! I adore crochet, and wish I had more time to try some of your cool ideas. Hi Katie! Heh, I had to go back and re-read what I had said up at the top, since I don't remember being particularly inspiring. LOL!!! Yay for M names! I was lucky that my last name, Maraia (pronounced Mariah), sounds cute with every name in the world, so we were free to name her whatever crazy thing we wanted. Holy guacamole! I just found your blog and I AM AMAZED! ABSOLUTELY MATHEMATICAL! Hi, Mandar! A BIG WHAT UP back from Orange County!!! I'm delighted that you found me (honestly, I still freak out and giggle whenever I see I've got new readers! LOL!!!) and I want to say THANK YOU! for all the kind words. Hope Ohio thaws a bit for you! I have a few friends and family members having babies this year and would like to make something special...However, I am a newbie to crocheting (& knitting...I have found crocheting easier) any easy, simple..but still cute projects you could suggest...or come up with ;) So far...I have 2 girls coming soon. any info you can share would be most appreciated. I just found your website & loved both Market bags that are so colorful, just great awesome work. I have a friend she lives in Knoxville who is a 15 year breast cancer survivor. Its nice to read what you share about yourself, and your family. I don't have any website or blogs but enjoy the free patterns that so many sites are willing to share. I use to live near Disneyland ":) but now live 5 minutes away from the beach in beautiful Oxnard. Thanks for sharing your patterns. Hi! I am crocheting a shawl from Aunt Lydia's cotton thread and would like to paint it with metallic rainbow colors. Do you know how to do this or somewhere I can go to find out? 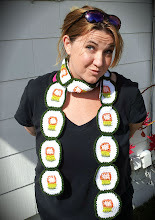 Hi Jaime - I just found our blog from All Free Crochet. You ideas and crafting is fabulous!! Wow you are a crazy crochet goddess. I have been crocheting a long time and it's so incredulous to see such wonderful projects. Thank you so much for posting the for us who share your passions. Hi! I really like your patterns! They are so easy to follow. Is it okay if I sell my finished pieces using your patterns? I will most definitely give you credit (name, webpage, etc.) on my tags. Thank you!